A Cooking Bookworm: I LOVE Chocolate!! Oh, yes, I DO!! A rare day goes by without some sort of chocolatey goodness passing my lips! ;-) When chocolate sources are short, I can be found snitching a chocolate chip out of my baking canister or using a spoon to scoop out the fudgy goo from a frosting tub. Mmm, yeah, I really love chocolate. Really. Another Chocolate Friday is here! My coupons for FREE chocolate are on their way...are yours?? 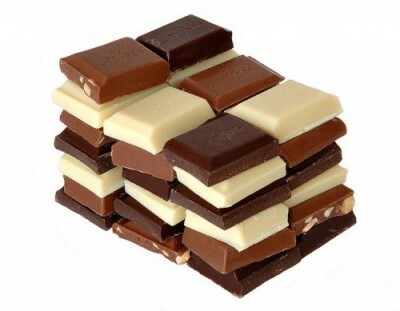 I also just came across Lisa's blog, Stop and Smell the Chocolates! Why, thank you! I think I will. Lisa has guaranteed chocolate posts every Friday! Mmmm! Today, you can find a recipe for Chocolate Chunk Raspberry Bars by Melissa from Frugal Creativity. OK, but the only thing I'm still not clear on is, do you or do you not, like chocolate? Stopping by from SITS - you commented above me today! what a pretty blog. sure makes me hungry though! Thank you for stopping by my site. And for adding my button I really appreciat that. I do hope you come back again. I like your blog very much. I am thinking of Christmas in July myself.